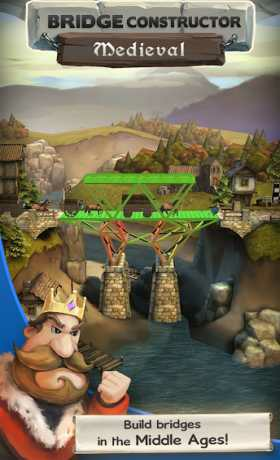 Bridge Constructor Medieval turns back the clock a few centuries to the time of knights and castles. Build sturdy bridges to supply your city with provisions – or cunningly constructed bridges that collapse under the weight of attacking troops, sending the horde of enemies into the abyss below. You won’t even be safe from cannon fire in the 40 brand new levels. Protect your foot soldiers and your horse-drawn carriages with covered bridges and stable pillar structures. Besides building stable bridges, there’s also plenty on offer for veterans to discover in the new game modes. 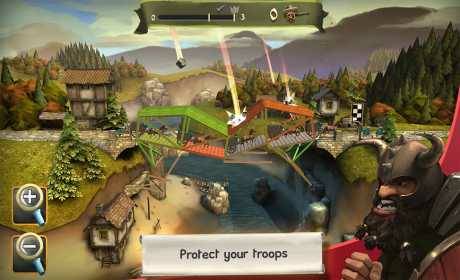 In the siege level, your bridge is bombarded by enemy catapults. 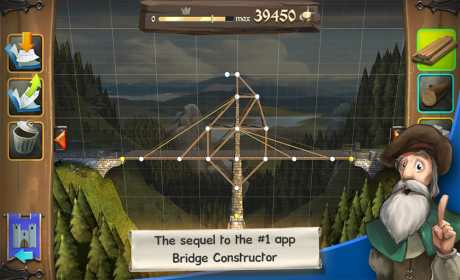 Strengthen your bridge so that it doesn’t collapse, and protect your own troops on the bridge with a bridge roof. Like the game? Then support us with 5 stars in the Google Play Store!